Holdback Clutches are precision devices which lock the inner and outer races through the wedging action of cams to transmit torque in one direction of rotation and overrun in the opposite direction. Depending upon their application, these units are sometimes referred to as Freewheels, Sprags, Overrunning, Backstop or One Way Clutches. Our engineering staff offer an on site inspection service and survey of your holdbacks. Customers have found this helpful as we regularly find holdbacks operating well outside their intended speed / torque ratings. Running holdbacks above their capabilities has the potential to endanger life and equipment. 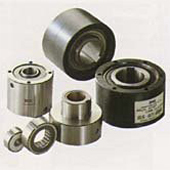 Tsubaki “WHS”” Series in service- Iron Ore Industry. Our workshop facility can inspect, repair or replace any brand of holdback. Unfortunately, this unit was beyond repair and was upgraded to a more suitable Tsubaki brand. An extremely popular holdback is our replacement for the outdated MA Series. The Tsubaki BSWHS series offer grease lubrication, higher torque and overrun speed ratings while retaining the original 45 MA footprint.